The Premier Auditorium Copper brings the same playing and sound dynamics as the Premier Concert Copper, but with a more pronounced presence. The larger body moves more air and as a result creates a larger sound. For ensembles the auditorium holds its own while still delivering the beautiful to the ear rich blossoming notes. The larger lower bout invites a fuller bass response, working efficiently with the rosewood back. 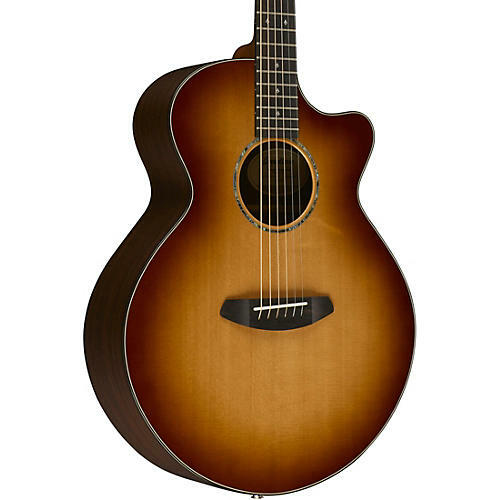 The Premier Auditorium Copper is a magnificent ensemble guitar. Indian rosewood, dalbergia latifolia, originates in India and southern Iran. Indian rosewood has been the standard rosewood choice for decades. It is often associated with the great dreadnoughts, and is an amazingly neutral wood that takes its personality from the player. Well-balanced lows, mids, and highs make it a natural for many styles. For the past 30 years, a vast majority of high-end steel-string and classical guitars have been made from Indian rosewood. It is famous for rich basses and a clear treble response with well-balanced lows, mids, and highs. It is a black-streaked wood with coloration that usually leans toward purplish brown, and then oxidizes to a rich brown color. Breedlove graduated tops, featured on select models, contribute stunning balance from lows to highs. How? Graduated tops are slightly thicker on the treble side, balancing the higher energy treble frequencies with the lower energy bass frequencies traveling through the thinner bass side. The result: clearer, cleaner highs and stable, resonant lows. Because no two soundboards are exactly the same, Breedlove craftsmen evaluate each top for stiffness and density, and then graduate it accordingly. The amount of graduation is customized for each individual instrument. The top is sanded to the precise graduated thickness to achieve optimal flexibility and stiffness. This hands-on process is one of the major contributors to the Breedlove sound.